If you look closely, you will see that the “den” is brighter than all the other letters. 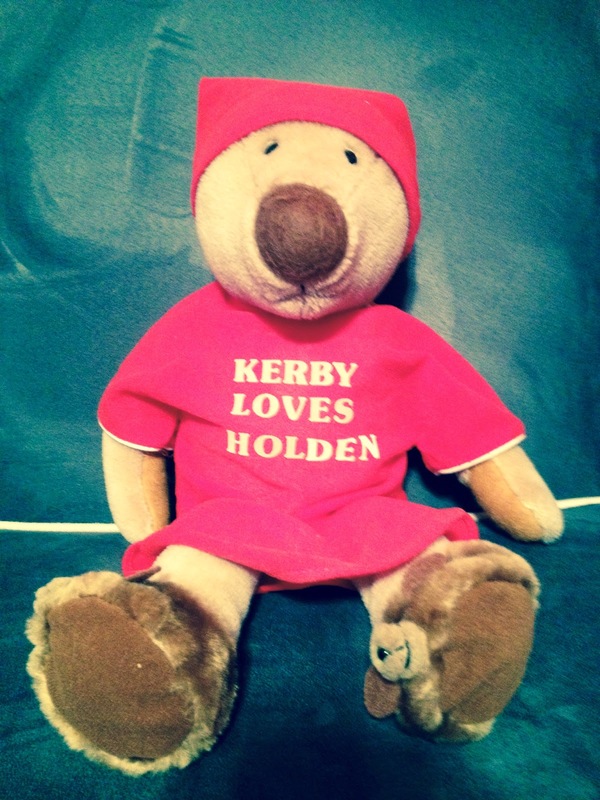 That’s because Kerby was my bear when I was little. He is a 1983 Avon classic. My mom took off the “ly” from Holly and replaced it with “den” so my son can have a piece of my childhood. Only my mom would still have iron-on letters from 1983. For 30 years, those letters were sitting in a drawer somewhere, collecting dust, for no apparent reason. Holden gave those letters their reason. Apparently Avon Kerby bears sell on eBay now for over $100 apiece. Who knew? This bear is valuable in more than one sense. i love seeing well loved Kerby bears; the one i bought 30 years ago, kept and then gave to my first born daughter is still going (although more than a little worse for wear). Chloe and Kerby now live in Germany and are both back home for a holiday. Kerby is booked in for some much needed surgery and refreshment treatments haha I am considering buying another other one and putting it away so that i have a replacement because Chloe loves her Kerby hard and he won't last forever.